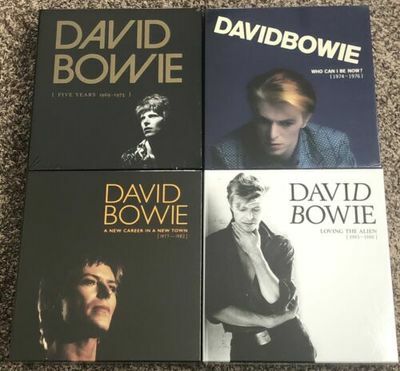 Up for sale is a David Bowie Vinyl Lot. I purchased each box set as they were issued. I never opened any of the sets. They are in NEW condition. They come from a smoke free home. Included are Five Years 1969-1973, Who Can I Be Now 1974-1976, A New Career in A New Town 1977-1982, Loving the Alien 1983-1988. They are original issues. The last three box sets include the original shipping boxes. Unfortunately the Five Years box did not come with the shipping box when I bought it. Insurance is a must. I can ship using media or priority, it is your choice. Thanks for looking. USA Only.